Zack Greinke and Felix Hernandez Show the Changing Face of the Cy Young Award. 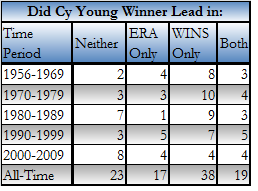 As we can see in the above table, the Cy Young voters’ perception of what’s important has changed over the years. For the first 40 years of the award wins mattered the most, with little regard to ERA and almost no thought about WHIP, K/9, and K/BB. As time went on ERA became slightly more important. During the 2000s, the bias towards the guy with the most wins declined. Going forward, we will rarely see the guy with the most wins get the Cy Young unless he has other great stats or at least 8 or 9 wins more than the next guy.